Maximum Temperature Measurement up to 760°C. Click if you want to know more about thermocouples. Miniature, fast response probe with 480°C max. surface temperature. Ideal for surface temperatures of small electronic parts. Replaceable Element not supplied, P/N 88006(*)-RE . Miniature, fast response probe. Ideal for measuring the surface temperature of small electronic parts. 250°C max. surface temperature. Replaceable Element supplied free, for additional elements order P/N 88007(*)-RE. Long, 300 mm reach version of the 88006. Fast response design with 760°C max. surface temperature for use in oven and furnaces. Replaceable Element not supplied, P/N 88010(*)-RE. High temperature, right-angle probe, with miniature pencil type head. Best suited to stationary surfaces, with sensing head parallel to the handle. 480°C max. surface temperature. Replaceable Element not supplied, P/N 88016(*)-RE. High temperature, right-angle probe, with miniature pencil type head. Best suited to stationary surfaces, with sensing head perpendicular to the handle. 480°C max. surface temperature. Replaceable Element not supplied, P/N 88026(*)-RE. Right-angle probe for fast response times. Sheath length is 102 mm Max. surface temperature is 760°C. Replaceable Element not supplied, P/N 88106(*)-RE. Right-angle, long reach probe with fast response design. Sheath length is 203 mm, with 760°C max. surface temperature. Replaceable Element not supplied, P/N 88107(*)-RE. Right-angle, long 300 mm reach probe with fast response design. 760°C max. surface temperature. Replaceable Element not supplied, P/N 88108(*)-RE. 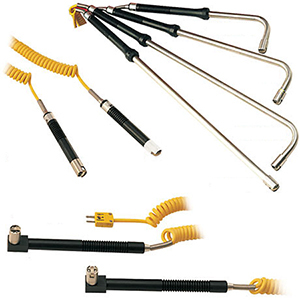 300 mm long probe rated to 760°C for use in ovens and furnaces. High-temperature, right angle probe rated to 480°C; sensing head is perpendicular to the handle. All dollar amounts on this site are shown in Euro currency. Note: To order Replaceable Elements, drop "-IEC" from the model number and add suffix "-RE" to model number. See Ordering Example immediately below.